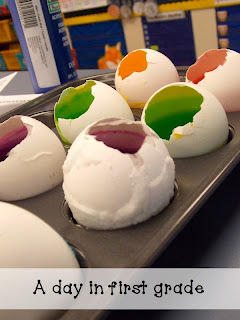 The other day we completed the “egg geodes” science experiment. 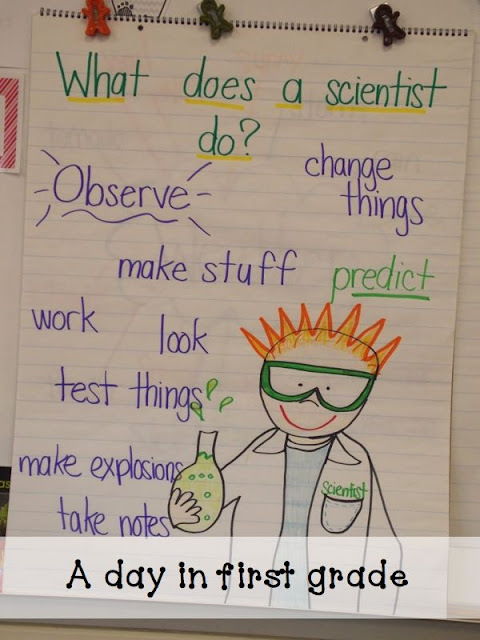 I took out one of the first anchor charts we made this year as a class and we brainstormed what we thought would happen during this Science experiment. Now, this is probably our 20th science experiment this year so we have gotten pretty used to making predictions, coming up with a hypothesis and using our science words however, we are now practicing recording what happens during our science experiments. As a group we added our ingredients into different cups. We then poured them into eggs that I had already cleaned out. Then we observed them using our Science tools and then got to work writing down what we did in our experiment. 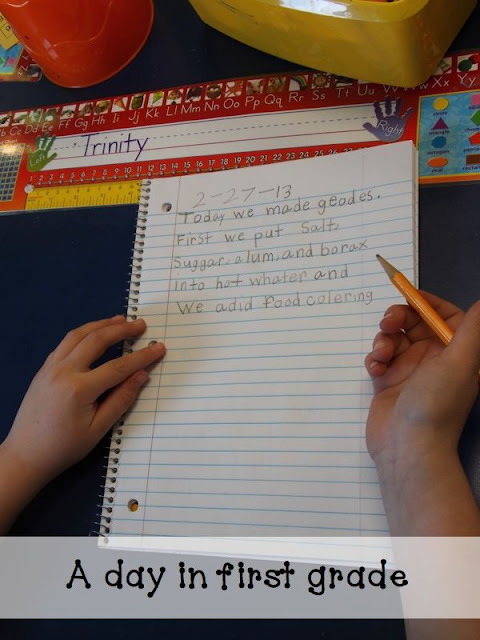 Throughout the week we added to our Science journals and recorded our findings. On day three things got really cool. And by day 5 the kids were asking to do it again. 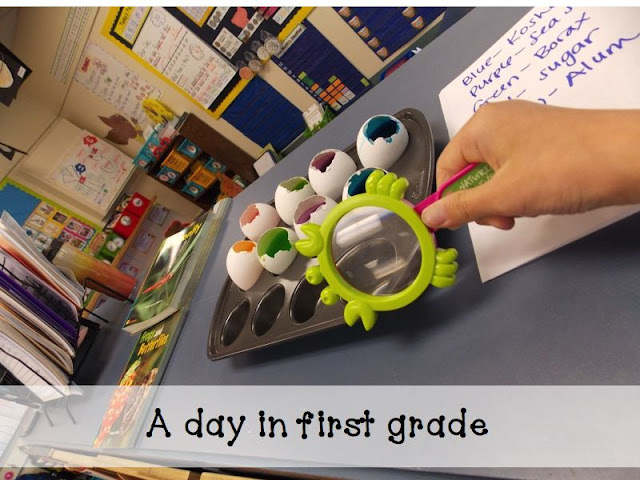 It was a neat experiment to work on our observing skills and also our writing skills. The students did a great job making predictions and writing down their observations. In retrospect, when I do this science experiment again I will only use the salt solutions as they worked out much better than the other ingredients. We had tried Alum, Borax, Sugar, Kosher Salt and Sea Salt. 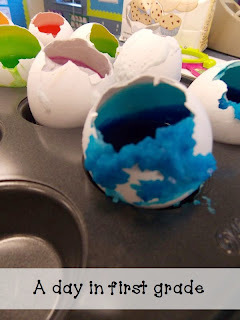 The Kosher Salt is the blue egg in the pictures. Next year I will do a few different colors of Kosher salt and one egg of the Sea Salt (the purple one). In order to do this science experiment you have to be able to have hot enough water to get the ingredients to dissolve. To accomplish this, I used a microwave to heat up the water. For each of the ingredients you add 1/4 cup of the ingredient to 1/2 cup of HOT water. This is also when I added the food coloring. Then stir it until it is dissolved. That was nearly impossible with some of the ingredients so we just made do. I placed the eggs in the mini muffin pan that the lady had suggested and then used a funnel so we could pour our liquids into the eggs without spillage. 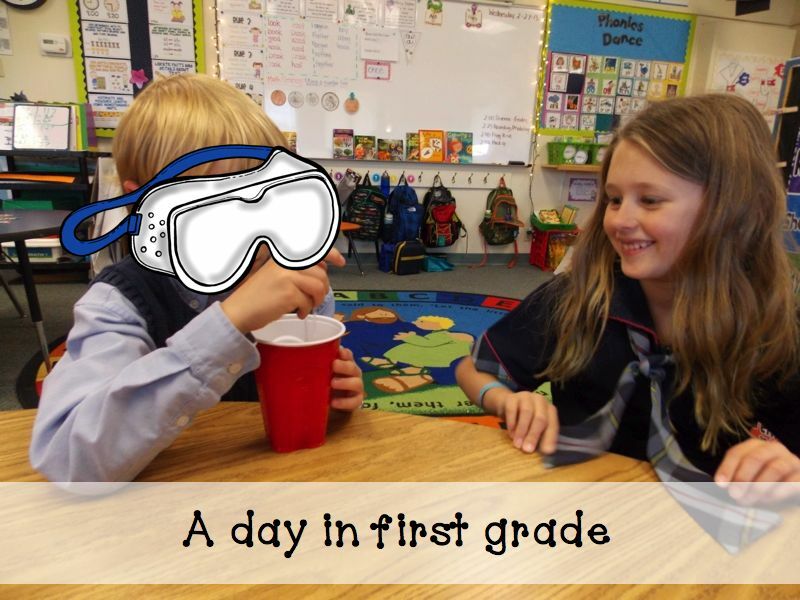 The next day you already can see some growth which is awesome for first graders. They loved coming into the classroom to check out the experiment. They even were excited to write about it. Refer to the link for any other steps and procedures in the experiment. 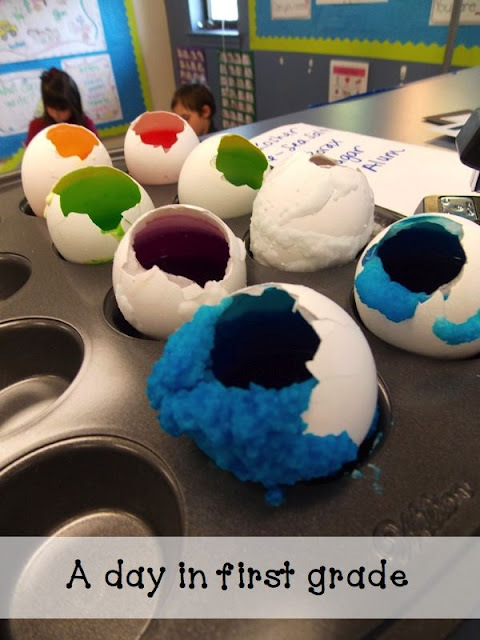 You find such fun and amazing projects to do with your students! 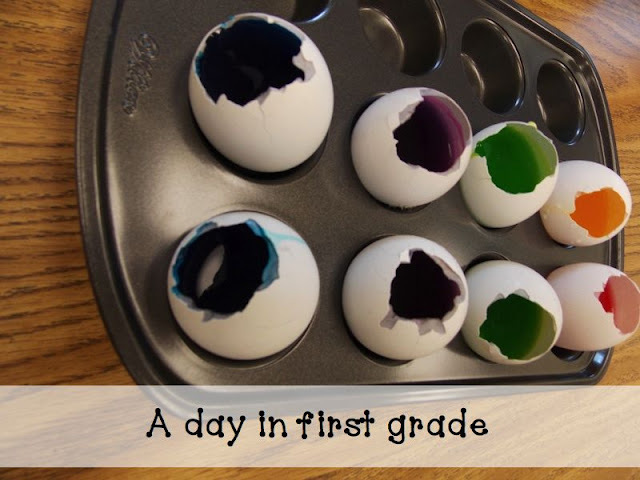 I can’t wait to do this with my kiddos! Thanks for sharing! I already checked out TinkerLab! 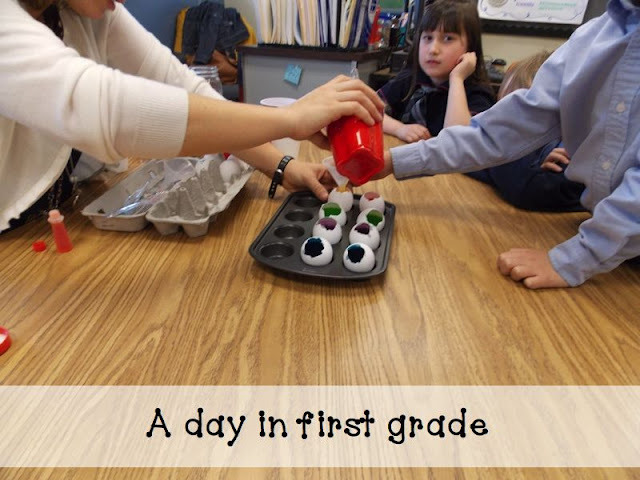 It is a great blog full of fun science experiments! Wow! What a fun experiment! Those turned out fantastic! Your kiddos must really love science! You always have the best ideas for experiments! Anything ‘egg’ grabs my attention! Thanks for sharing!